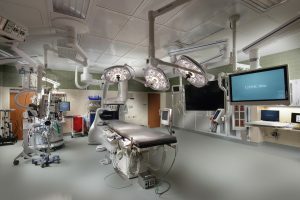 Hybrid Operating Rooms-What are they? 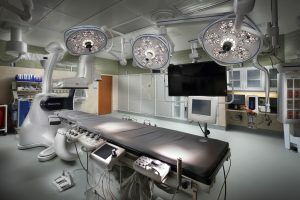 A new trend in operating room construction is gaining popularity across the country as increasing numbers of hospitals implement hybrid operating rooms into their existing facilities. These high-tech rooms are valuable to both health care providers and their patients. Hybrid ORs are multifaceted and highly functional. They provide the advanced imaging needed to inform those performing difficult surgical and interventional procedures allowed by today’s technological advancements in medical treatment. Most significantly, hybrid ORs eliminate the need to move a patient in and out of the operating room for imaging that informs surgeons’ actions: a time-efficient and potentially life-saving feature. These emerging interventional suites present several significant advantages, although issues could arise if the implementation is not meticulously planned and carried out by all involved. Imaging-compatible surgical table, lights, and surgical booms to accommodate open, minimally invasive, and interventional procedures. Configuration of these spaces and selection and placement of equipment depends wholly upon the intended procedural uses of the room. Get input from any surgical team who will use the room. Consult surgical and perioperative departments, administration, facilities management, and the IT department during design. Tour existing hybrid ORs for firsthand experience of these spaces. Select equipment vendors early and encourage them to communicate about design and installation. The best location for a hybrid OR is within the existing interventional suite. If the current ORs are separated from the interventional radiology suite, then the hybrid OR should be located with the traditional ORs in order to eliminate the need to duplicate materials and staff to accommodate two OR locations. Because many different disciplines and staff members will be using and working within the area of the hybrid OR, workflow must be considered. Patient flow, materials supply, and team proximity are all important topics to visit to ensure the highest efficiency and eliminate communication or space issues. As an experienced healthcare facilities contractor, MBM has had the privilege to complete the construction of hybrid ORs in several Pittsburgh area hospitals. MBM’s team of builders understands the critical attention to detail required in the design and construction of this space and in the placement of each piece of equipment and furniture. We have turned existing operating rooms into hybrid ORs and have built brand new hybrid ORs with all the necessary support spaces to facilitate use. We are meticulous about each detail and take extreme care in putting everything perfectly in place. If you are interested in our work on hybrid ORs, please click the “Healthcare” tab under “Our Work” on our website to view pictures. You can schedule a hybrid OR consultation with MBM by calling 412-379-9000. We look forward to making your healthcare facility a state- of- the- art treatment center.